In fact, the reported standard deviations should be impossible given the mean and the range of values: Even, if all values, except the two bounds given in the range, were exactly the same value as the mean, the standard deviation would be for the case of Variable 1 (pre) 1.24((Note, that the mean of the sample is, of course, then different. But as we are only interested in the lower bound of dispersion, this is irrelevant here.)) – which is notably larger than the published standard deviation (0.36), but smaller than the calculated standard deviation (1.65) if it was the standard error of the mean. To further underline, that the values are more likely if they were standard errors, I have performed quick simulations.2 The simulations will be shown for Variable 1 (pre), but procedure and results are similar for the other three variables. Further, I did not include any dependencies between the variables, which should not change the results. 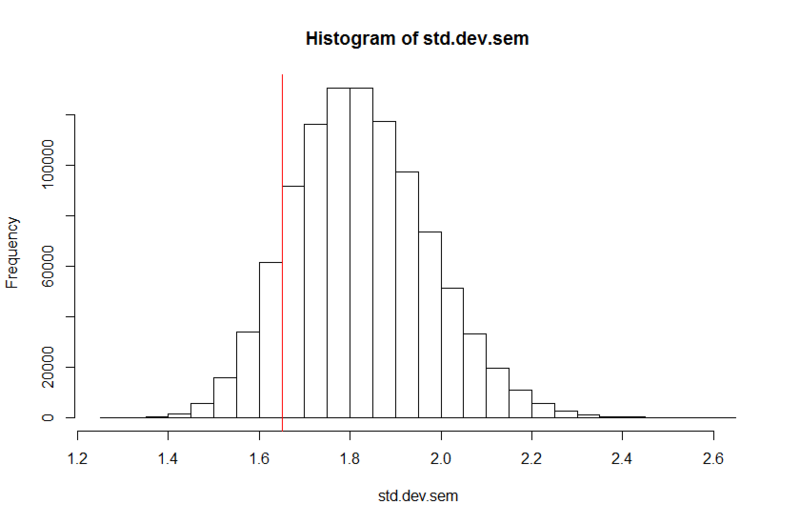 Our simulated sample will consist of the given minimum and maximum values (2.59 and 10.04) and N-2 = 19 items randomly drawn from a normal distribution with mean = 7.60 and standard deviation = 0.36. All values will be bounded by acceptance/rejection to values between 2.59 and 10.04 and rounded to two decimal digits. Performing 1,000,000 simulations this way, we find that zero samples have standard deviations as small as the reported or smaller – this is expected from above calculations. 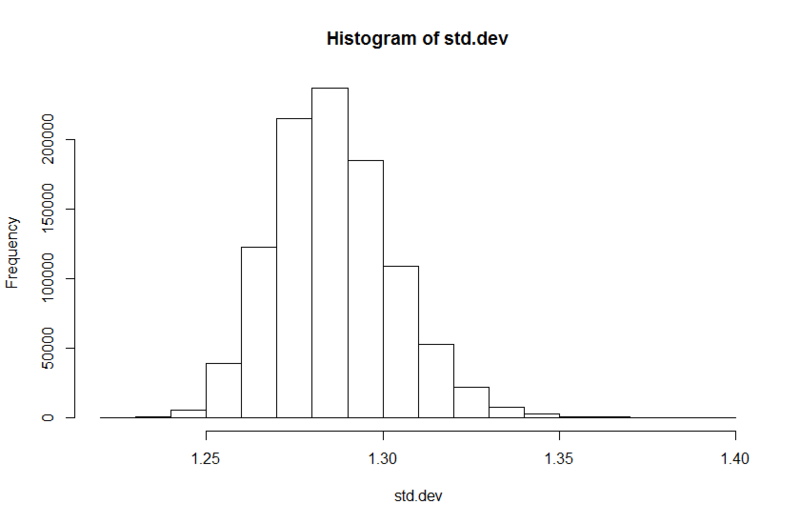 The following histogram shows the distribution of standard deviations from the simulated samples. The same pattern results from simulations for the other variables. Based on these considerations, I would strongly assume that the authors of the original paper mistakenly have reported standard errors as standard deviations. A mistake, that is not so uncommon. It is notable, however, that for Variables 3 and 4 the analysis yields different results: the published values do make sense as standard deviations. 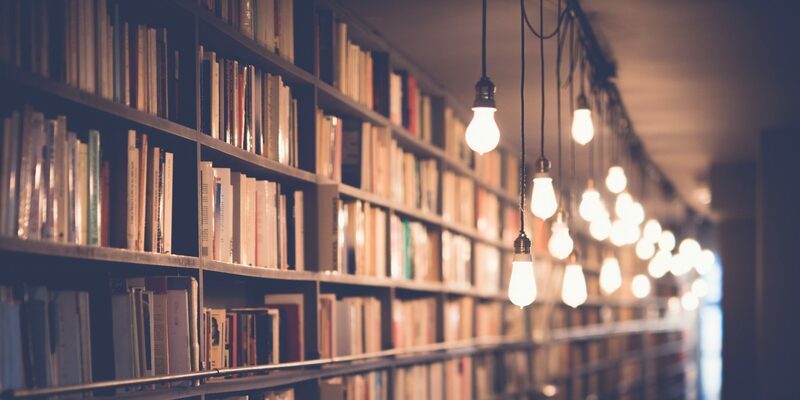 This case is another example how openly shared data can help to improve the validity of scientific publications. Mistakes happen and that is not so much of a problem, if they are easy to identify and to correct. Please note, that I do not know the original paper, so the paper might contain further information on the nature of the reported number that could influence the arguments presented herein. Please refer to the blog post at Non Significance for the “raw” data used in my arguments.